How do I apply for Suggested Pins? Do you have great content that you want more people to see? Learn more about applying your RSS feed enabled website for our Suggested Pins. Suggested Pins are a great way to find relevant content, but what might be even better than finding content for yourself is having other people see and pin YOUR content! Learn more about how Suggested Pins work in the Knowledge Base Articles, "How can I find similar Pins to schedule?" and "Where do suggested Pins come from?" 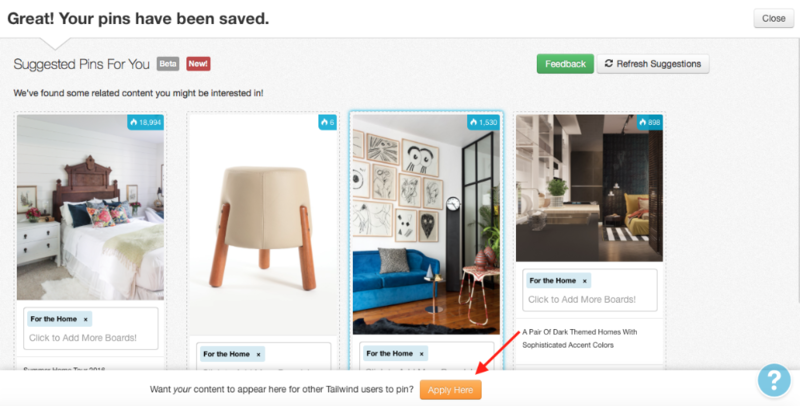 You have the opportunity to submit your own domain feed so other members who have similar interest see your content in the Suggested Pins pop-up box. Think of it as the ultimate sharing tool with other Tailwind members. Click the “Apply Here” button in the pop-up box that shows after scheduling Pins, or Submit Now. Helpful Tip: We're looking for websites (aka domain) that have RSS Feeds- so please submit only RSS feed enabled websites. You will NOT be submitting your Pinterest profile, individual pins, or posts from your website.